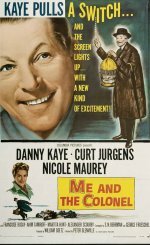 Danny Kaye disappointed his young fans but gained new admirers with his subdued performance and altered appearance in this serious comedy, playing one half of an odd couple: a self-effacing, resourceful Jew fleeing the German occupation of Paris in 1940. Joining the adventurous journey of escape to the coast is an arrogant, aristocratic Polish colonel, played by Curt Jurgens, who overcomes his anti-Semitism to respect and ultimately admire his humble companion. Director Peter Glenville draws two finely judged performances from his leads, and there are some expert supporting performances, particularly from Martita Hunt as a mother superior. The ride is uneven, but often delightful.